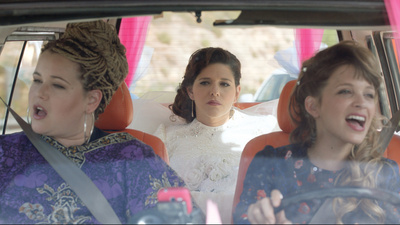 Don’t go into The Wedding Plan thinking it is a conventional romantic comedy. Yes there is romance. Ys there is comedy. But the way the film twists and turns, and the weight of the story make the film something much more. Michal has finally found a man she can marry. Finally she will be a al that she hopes for herself. However with less than a month to go her fiancé announces he doesn’t love her and walks out of her life. Michal then does what any woman would do and keeps the hall booked and trusts that god will find her a husband in the next 22 days. On the face of it The Wedding Plan is an engaging “romance” that is full of all sorts of great characters you’d love to hang with. It’s a film about trying to find the one who is truly the right one. On that level the film is really good and very entertaining. On the most basic level the film will entertain and cause you to audibly react, as happened to several people at the critics screening, as the film wends through the final third. Not so obvious until you see the film is how much the film is not a simple rom com but instead is a spiritual quest to do what god wants. This is a film that is very much tied into Judaism, or at least some sects. True love isn’t necessarily the way to go, as can be seen by Michal’s use of matchmakers and waiting for god to connect her to Mr Right. This is a film that is playing as a mediation on what is a good relationship, what is a good woman and what are we supposed to do in life. The final image of the film which is not what we expect (at least if this were a Hollywood film) is coupled with a song that makes the denouncement more than a marriage but something greater. To be completely honest I did not get a lot of the details in the film. While I have Jewish friends and relatives, their belief and culture is not as deep as those in this film. I was not exposed to Sabbath dinner songs for example so implications of what some songs truly mean was lost one me. While one of the other writers at the screening schooled several of us after the film on some of the finer details. While this didn’t change my love for the film, it deepened by understanding and made the film seem to me more a spiritual quest of one woman to find her connection to god, much like a pilgrim might use when he travels to the Holy Land or a Buddhist might find when he or she does a series of temples. However I think that most people who see this are not going to see this as philosophical journey. Rather they are going to see it as a ‘rom com”. On the most basic level the film is a charming and funny film. There are numerous big laughs and running gags through the film that can’t help but delight. For example one of Michal’s friends is dating a convert to Judaism from Japan brought giggles every time it was mentioned. While the course of the romance at the center is bound to result in much discussion- a bunch of us stood on the street after the film and hashed out who exactly Michal should have ended up with- the film will ultimately please all audiences. The dual nature of the film is best summed up in one of the final lines of the film. When Michal is asked the meaning of the wedding going forward now that the groom has been found she replies that it is the end of the world as they know it. It’s a funny line delivered for maximum comic effect but there are deeper implications- it truly is the end because by getting married and accepting the groom she bends to God’s will- a god she now knows exists. Its a moment where we laugh and think. Its this ability to have its cake and eat it too that makes this film one of the best films at Tribeca and highly recommended.